Methi seeds are high in protein and nicotinic acid, both of which are vital for rebuilding hair follicles, promoting hair growth, and preventing hair loss and thinning. Home Remedy - Make a paste of methi powder and water. Apply the paste on your hair and keep it on for 30 minutes. Rinse thoroughly after 30 minutes. Add 3 tablespoons of methi seeds in a 3/4th glass of coconut oil and place it in a water bath. Let the boiling water heat the oil mixture. Now pour this mixture into a glass bottle and place it in a sunny place for 7 days. Shake the bottle once in a while. Strain the oil and store in a container. Massage your scalp with this oil at least an hour before shampooing. Dandruff is essentially flaky skin caused due to the dry scalp or under-nourished hair. Methi has been used for many years in India to cure this recurring problem. Methi contains many vital oils and skin-enriching elements that help keep the scalp hydrated and moist, thus preventing dandruff. Home Remedy for Dandruff - Soak around 2 tablespoons of methi seeds in water overnight. Blend it in a mixer to make a fine paste. Mix the paste with a cup of curd and apply it to your hair. Keep the mask for an hour and rinse it off with a shampoo. Apply regularly once a week to effectively prevent dandruff and itchy or flaky skin. 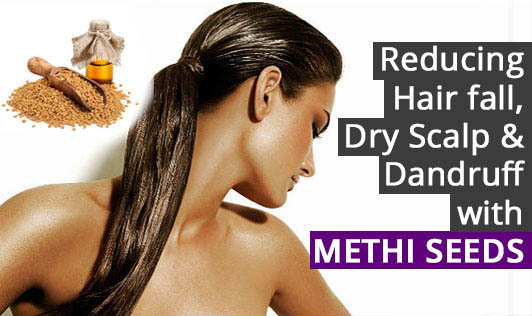 Methi seeds are rich in lecithin, an emulsifying agent which acts as an excellent hair conditioner. The soaked methi seeds when crushed create slimy mucilage which makes the hair smooth and shiny. Home Remedy for Shiny Hair - Add methi seeds to coconut oil and keep them soaked overnight. Use this tonic oil, to massage your hair and scalp at least thrice a week. Not only does this therapy give you shiny hair, but it also reduces hair fall and promotes hair growth. Make a ground paste of methi seeds along with hibiscus flowers and apply it on your hair, as well as the entire scalp. Keep it on for 30 minutes and rinse later. Mixing methi and hibiscus flower increase its conditioning properties and this gives you shiny hair. Try the above methods to gain maximum benefits out of methi seeds. Natural remedies take time to show results but are definitely effective. So be regular and you will definitely achieve the desired results.